Kep, Cambodia, 10 November 2017 -- Fr. Filiberto González, World Councilor for the Social Communication, paid a visit to Cambodia to know the social communication department. He was joint by Fr. Drans Nolasco, SC delegate for the Philippine North Province (FIS) and SC coordinator for the EAO region. Fr. 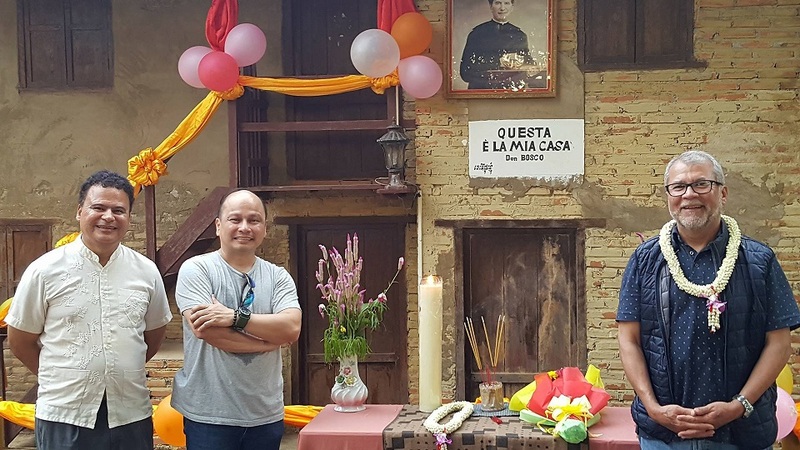 Filiberto González visits the Don Bosco Birth House Monument in Kep Province with Fr. Albeiro Rodas (SC THA-KH) and Fr. Drans Nolasco (SC FIS). The Social Communication program of the Salesian Delegation of Cambodia, began in 2007 in Sihanoukville with the construction of an audiovisual studio and the engagement of 9 young people from rural areas. Within the Cambodian development, media became a key in the reconstruction of the country and the input for its own economy. Television channels, radio-stations, newspapers and others were in need of skillful personnel. In 2011 the program opened also in Kep, during the opening of a new technical school at the southest of Cambodia. Between 2007 and 2017, near 1,000 young people from different Cambodian provinces, got an associate degree in Media Communication to work in different companies. The Project became also a way to promote the Don Bosco charisma in the country through activities like the translation of Salesian documents and messages to Khmer language, the dubbing of the Don Bosco and Mother Mazzarello's movies and reporting news from the Cambodian Salesian family.